Everybody seems to want “full fibre” broadband, but there are caveats. People moving into new build developments, specifically those that are only being served by Openreach’s (BT) FTTP “ultrafast broadband” technology, are running into problems because they’re unable to keep their phone number. A new report in The Telegraph complains that customers who adopt BT’s ‘up to’ 330Mbps capable Fibre-to-the-Premise (FTTP) based broadband packages are being left frustrated after finding that they cannot also carry over their fixed line phone number to the service or when migrating between other FTTP providers. The newspaper claims that small firms, which rely on landlines to run their businesses, and the elderly, who have had the same number for decades in many cases, are “most vulnerable“. “I couldn’t believe it when BT told me they couldn’t move the landline number, it’s been possible on copper lines since about 1860. It’s a massive own goal for BT given the fact their rivals can do this. Nobody in their right mind would use BT if they knew this. They have a duty of care to tell their customers before converting them from copper to fibre that they can’t take their number with them. Readers of ISPreview.co.uk will probably already be aware that this is not a new issue and it’s one that will be similarly shared by most other “full fibre” networks. A big part of the reason for this is because optical fibre networks are separate data-only connections and they cannot carry analogue voice signs like traditional metallic copper lines. As a partial solution Openreach can offer ISPs a “transition” product that essentially bundles a phone line alongside the optical FTTP service, although these aren’t always available to newer developments (it doesn’t make much sense to build both FTTP and copper) and some ISPs may choose to only sell the broadband-only variant of FTTP. Take note that people can also lose a number when moving between ISPs on copper lines too, such as when moving house and changing telephone exchange area. A spokesman for BT claims to have made the decision not to allow numbers to move between FTTP services because the firm anticipated “very low” volumes of customers demanding it. However, the operator also said that customers would eventually be able to keep their numbers, which is part of an upgrade due to be completed “over the next few years“. We suspect that the spokesperson is referring to the adoption of Voice-over-IP (VoIP) style phone (voice) services into their network, which are becoming increasingly necessary. We’ve explored this in more depth via our recent editorial on the same subject – The Changing Face of UK Home Phone Lines and Broadband Provision. Suffice to say that the old model, where customers were supplied with a “phone line” first and then broadband went over the top of that, is being reversed so that in the future you’ll buy broadband first and the phone service will then be optionally added. The reason for this is a combination of both technological (as above) and societal changes (e.g. most of us prefer to use our mobile phone for calling, not to mention Skype, WhatsApp etc.). However we’re currently stuck in somewhat of a transition phase between the old and new approaches. None of this will be a surprise to our regular readers, although the onus is on ISPs to ensure that customers are aware of the caveats and understand how to resolve common issues that may arise. Until a full product solution is implemented then those faced with a situation like the one above should remember that there are solutions, although some of them can be a bit confusing for the uninitiated and it may take time for numbers to migrate. The most obvious one is to try and get your phone number moved to a VoIP provider like Vonage, while businesses can also setup more complex VoIP / SIP systems. The advantage of VoIP is that you will no longer be constrained by the fear of losing your phone number when switching provider because it will be separate from your ISP’s control. The downside of migrating to VoIP is that if your broadband goes down then so does your phone service, which can be caused by a wider range of issues (e.g. protracted power cuts, faulty router etc.). Experiences do vary depending upon the setup. They should be told at point of ordering that they will loose their number unless they retain a seperate copper connection which will be extra cost. If it’s a business then surely the extra £15 (or what ever) a month shouldn’t be too much of a hardship. Likewise if they are paying a premium for fttp, surely a few pounds extra for a copper line won’t break the bank. I’d just be happy to not have to have a landline. Many of the above related gripes reflect cases where a separate copper connection may not be possible because the old network doesn’t exist. Lol, you’d think so. However, it never ceases to amaze me how small firms are willing to spend hundreds of pounds a month on rent, thousands of pounds a month on wages, but try to squeeze every last penny out of their broadband spend with a few tens of pounds being considered far too much! Does the PSTN USO still apply in these cases? If someone doesn’t want FTTP, does Openreach have to install copper to deliver a phone line? The issue with specific respect to BT above is more to do with the loss of a phone number and not so much the copper line itself, which I don’t think is covered by the USO. One could argue the PSTN USO is to blame here as all of the phone systems should have been moved online ages ago, preventing problems like this arising. The point here is that on this particular site there is no copper, so the option does not exist. The premises is served by FTTP only! I’d have no issue paying the extra for the copper line were it available, but it is not. Furthermore, this issue only affects BT. Other providers allow you to take your number with you. It is to do with the servers and software used by BT as opposed to their competitors. AAISP offer VOIP for £1.20 per month and will easily migrate your number in, hardly an expense is it. But VOIP does not work in a power cut. FVA over FTTP ONT is supposed to. This is the main reason for not just going to VOIP. “I couldn’t believe it when BT told me they couldn’t move the landline number, it’s been possible on copper lines since about 1860″. Did telegraph stations have landline numbers? The absolutely correct date should be 1879 and, yes, the Electric Telegraph Company operated telephones with numbers, not telegraph stations. This is similar to FTTP in Bath which is 01225. Lines were being given 01761 numbers. I wish I had this “problem” of having FTTP but only being only able to use VoIP! Simple solution is to use a VoIP provider such as AAISP or Vonage who charge a monthly fee or use the likes of Sipgate Basic who offer a monthly fee free PAYG VoIP service. A VoIP phone adapter or a native VoIP cordless phone can be bought on Amazon easily enough. Or your VoIP provider may even provide the hardware – I think Vonage do this. Personally I use a VoIP provider on my FTTC service so I don’t have to pay my broadband providers exorbitant call charges. * I am not affiliated to any of the above companies. Exactly what @Blueteeth said. I wish i had this problem. Definitely falls into the “nice problem to have” category 🙂 . Oddly I had almost the opposite problem. When BT installed my FTTP they came a different route to my copper. They then some while later decided to remove the old copper route (just me on the copper) and bring my copper ~700 metres alongside my FTTP cables. Apparently they had wanted to do this originally but they don’t have long enough sections of combined fibre/copper cable so they had to use both. When they told me what they were up to I mentioned they had already fitted (unrequested) alongside my FTTP install a VOIP box. I suggested surely it had to be cheaper by 1000s to just give me VOIP and not bother with the copper but they claimed they couldn’t do that. Not sure if there was a technical reason or just internal rules (BT/OR ringfencing) but from a cost point their actions were quite quite mad. @Joe – just imagine what a copper LLU provider would say if Openreach excluded them from supply by not providing a copper path back to their MSANS? @Gadget: Rural village exchange samknows says LLU no for every provider except talktalk which oddly says ‘has not yet unbundled your exchange’ But then its said that a long time. While, yes, you can switch your number to a VOIP provider. The VOIP switch is unfortunately a dead-end at the current time. If the provider you change to, changes their prices or terms of service then you are stuck with that provider unless you want to change your number at a future switch. Unless something has changed recently then, as I understand it, there is no current number porting system in place for VOIP providers. Therefore you can see that even if someone had been aware of this then they might be wary of going down this route as they would stuck at that point. People actually use land lines still… mobile is the way forward, you already have your contacts saved, you can “ok google” for a business number. Caller ID (number and name if saved) already displayed not an additional charged option. Why would anyone give a monkies about their land line number? “Why would anyone give monkies about their landline number”? In a genuine life & death emergency, an always working landline could potentially save someone’s life. Sure every person has a mobile these days but I’d trust a POTS service more than a mobile in such a situation. At home (home counties this is) inside I can receive 2G – however I do not have any 3G service….4G? wot’s that. A nearby village 2 miles from a major A road has a barely function 2G service – it works most of the time provided you are in the right place in the house. Another village in the opposite direction has a text-message-functional only 2G service but no voice capable 2G service. A large Welsh village of around 1000 homes has NO service at all from any provider in the majority of the village – your phone goes to “no service” symbol as you enter the village. NOW you do understand why people use landlines? Dave, that’s great if you have mobile reception, but at this postcode there is no mobile reception with any provider and we are not talking about the wilds of Scotland, but rural West Sussex. I am very sorry for everybody not on FTTP. I had 0.9mb for years. but I am now on 300mb FTTP. I ordered a new connection on FTTP on bt website as soon as it showed up. they gave me a new number, local code, which I assumed I would be able to swap when the killed my copper. the new line is great. uses FVA and plugs direct into the ONT. very clear. it was then they said they couldn’t swap the numbers. they didn’t admit they haven’t got the system to change numbers, as in article, just said no. the knowledge in bt OR is still very poor about FTTP. sales have no idea how it works. why don’t they teach themselves and the bosses. why are they pulling copper with fibre seems crazy. when voice works perfectly over fibre. ??? Openreach are mandated to provide MPF (metallic path facility) back to the local exchange for providers that want to sell telephony or ADSL from their own kit hosted there. On a “fibre-only” estate, BT might well have to prove MPF, but it’s unclear what the financial implications are. The USO requires that BT provide a voice line (and one capable of a rather minimal data rate) and clearly FTTP fulfils both those. FTTP can also be use for voice by unbundled operators, although whether they have installed the equipment to deal with it is another issue. Otherwise they would be dependent on BTW for voice services. In the case of OR’s obligation to provide MPF, then that is indeed true. However, in the case of our fibre-only estate (or even premises) the there is surely the prospect of being hit be a large excess construction cost charge, especially given the USO has been fulfilled. A tricky one – clearly taking away MPF where it already exists to put in fibre isn’t going to be acceptable to Ofcom, at least in locations serviced by LLU. However, it seems to be somewhat ridiculous if parallel fibre/copper networks had to be installed on new builds. For the avoidance of doubt, the property mentioned in the article is an old Edwardian TB hospital that has been converted into apartments. There is no MPF at the property. The FTTP has been run without any copper. The voice service is provided by FVA over Openreach FTTP. This is where the issue lies. If BT is your service provider on FTTP only and you move, even next door, to copper or FTTP, you will be given a new number. Think of the small business on a new business park or estate with FTTP only. When the business grows and they move to bigger premises on the same business park they will be forced to have a new number if they have BT as their service provider. Work in an electric power failure- it has it own independent power supply. Work easy and obvious to use – certainly to dial 999 out. Be obvious and self evident to find – apparatus is obviously recognisable, has a likely place to found & – in a blackout – might be traced by the lead. and any new non fibre line. One may desperately need a telephone that simply works. I would declare an interest: I collapsed in my living room, my sight went fuzzy, I didn’t think I could use a mobile phone and my last chance to help myself was to crawl across the floor to a traditional phone. In the end someone came in and could get straight on with it: just lift the handset and dial. Could I get it, I would take B4RN like a shot but I would absolutely keep the old line. I’m with @PacketSwitched on this. Having a heart attack or accident during a power outage and in the dark means that my landline is vital for using my ‘lifeline’ services. Some may say that a mobile phone is expected but how well does that fit with rural or semi-rural areas where power outages are more likely? Whilst I’m all for progress, it should not be solely for urban dwellers benefit. @Jim Weir, What is FVA? I got complained at by using the POTS acronym a while ago here. On a different tack, I thought BT, before Openreach separation, could offer number portability on landlines such as an ‘out-of-area’ number. e.g. A company (‘cos they could afford it) could have an inner London number if they were actually located elsewhere if they wanted. Is this not so these days? FVA = Fibre Voice Access. A voice service, a BT service offered across the optical fibre. It is a form of Voice over IP (VoIP), but it works independently of the data ISP, and gets higher priority on BT’s backhaul. The voice terminal is a physical port on the fibre ONT (=modem), and gets wired into the house’s extension wiring … so plain old telephones work as you’d expect and as @packet desires. However, it does depend on the ONT working in a power outage … which needs a battery backup unit installed. That gives (IIRC) around 4 hours availability. I think the battery only allows the ONT to provide the FVA service, not a data service. That means only BT’s FVA service would survive the outage, but a VoIP run over the top of the ISP connection (eg Vonage) would not survive. It might be possible for non-BT FVA services to exist, but I haven’t heard of one yet. They’re all possible, in a generic sense. But for things to happen, the ordering system has to allow it, and then trigger the action. The capability for Openreach to allow anything depends on a “use case” existing within the ordering system … and if one hasn’t been designed, coded and tested, then it can’t happen. 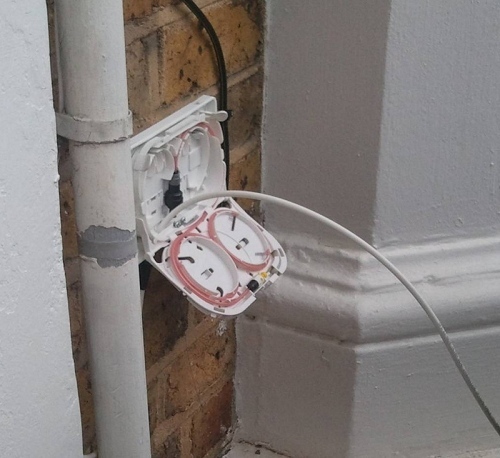 At some point, you’d hope Openreach would add a case to cope with this particular use case. So the progress of an entire nation’s internet connectivity strategy is reduced the adversity of Barbara’s landline and the local shop down the road which probably refuses to have a card machine most likely. I mean, I can empathise, but to be honest the answer isn’t to regress/adapt our progress it’s to educate the laggards. There writes a young male urbanite by the tone of the message!? That attitude makes me angry. Anyway the local shop hardly exists any more. It was running on borrowing due to the lack of customers and paying for a card machine on a dodgy internet connection was the last straw. The increasing local and national government requirements on the people mean that high capacity reliable internet is a must – quite a few retirees have to pay income tax which will be internet only for all in the near future. Matt B, perhaps you’d care to elaborate or explain yourself more clearly? I fail to understand the point you are trying to make. No one is trying, as far as I am aware, to regress or adapt progress. My point is, as a business, moving into a small unit on a new business park only supplied by fibre to the premises, with no copper available at all, assuming the business grows and needs to move to bigger premises, it then has to have a new number. Particularly for rural businesses, VOIP is not an option because of the possibility of power outages. Indeed, there are many not so rural businesses in the North and South West and elsewhere that have had their power supply interrupted by flooding, although their own premises have not been flooded, and could have been put out of business if they were relying on VOIP only. Good job BT do not operate in the USA then otherwise Apple moving to their new building Apple park, likely by the end of the year would not even be able to keep their same 1-800 number, let alone software engineers being able to ring through to the likes of Craig Federighi about software update progress who would have to have a new number. Yep god forbid we let BT allow little businesses like that to hinder things. Just another news item of BT stupidity and the same old people defending it. @US – Non geographical numbers like 0800 go through a routing platform to terminate on either geographical numbers or dedicated lines so not an issue. Service provider will purchase the number once they have a subscriber who wants one. Subscribers can request a specific sequence or the numbers that correspond to a name (example: 1-800-NUMBERS). This is called a vanity number. As BT can not swap numbers to a new FTTP line if they were a service provider in the states they would not be able to transfer that either. @Alan – No problem, what do you not understand, the 800 or whatever number terminates on a ‘normal’ number. I think you will also find that is the reason why many big organisations have several different 0800/0345/0845 etc numbers. Government departments and when they change premises are a good example and end up with a brand new 0345,0845 or 0800 number. Anyone that has tried phoning a government department with a 0345,0845,0800 etc number say a couple of years old and they have changed premises will be all too familiar with the messages of “This number is no longer in service” or “This number has been substituted by 0…… (if you are lucky). and the classic bleep tones when its been disconnected. BT have a hard enough time assigning them even when FVA is not involved let alone with this new comedic ‘errrr you cant have your old number’ ridiculousness. As others have also pointed out, funny it only affects BT. Probably involves work along with upgrading the string and paper cups. Far too much to expect. @US – you are completely wrong. One of the big uses of 0800 etc. numbers is to distribute calls across multiple sites. Call centres will have large DDI groups and assign a termination number for a particular service. That number has no connection with the dialled number. The same applies with single numbers for eg. a plumber who can receive calls from an 0800 number and a local number on the same line. @US – as you know there are many suppliers of 0800 etc. numbers, all able to terminate anywhere. The BT story says otherwise. @Alan – this not about non geographic eg. 0800 numbers. @US – government departments do not change numbers because they have moved premises, this shows how little you know. An 0800/0345/0845 number can not be applied to a new line by BT in all cases. A taxi firm where i lived just over 2 years ago had a similar issue to the content of this news item with BT and moving numbers. They could not move their old direct number over or their 0800 number, it was on and off story in the local free newspaper for several months. All the fault of BT in the end as some other company (i think it was amazingly Talk Talk, though may be wrong on that, be about the first good thing they ever did) which stepped in and managed to get things back for them albeit from memory what they had to do was convoluted. @US – we would need to see more details – any online? BT do not ‘apply’ an 0800 number from XYZtelecom to a line, XYZ just deliver it to the eg 020 number they are given by their customer. I imagine the news item about the taxi company is somewhere online though obviously trying to search for it with any term that even mentions “0800”, “taxi” and “bt” in it is basically impossible (would have to scroll through millions of random results about 0800 numbers, firms with 0800 numbers and items about taxis). The free paper concerned also appears to no longer appears to exist, i think it may have been bought out buy another local news publication but having not lived in the area for years i would not know who or the name of local news papers there now. You can choose to believe it or not, it is 100% true and i do not even see how it is a shock given the news item and similar issues. Just to confirm that calls to 0800 etc. numbers can be delivered to any UK geographic number. Any. Something you read in a paper is 100% true. Wow! Considering the problem went on for many months and BT did not solve the issue and it took another provider to solve it i fail to see how the papers story can be untrue. 0800 numbers can indeed be delivered to any UK geographic number, the problem as explained is when that geographic number changes. You would have to ask BT why they could not reassign the 0800 to a new geographic number. Disagreeing with me will not alter the fact a company other than BT had to help the business get its 0800 number back. With no details we cannot be sure of the full story. I doubt the business owner or the paper knew the details as to why it could not be done, for those details as stated “You would have to ask BT why they could not reassign the 0800 to a new geographic number.” Im sure there is a very detailed and technical reason should you require it. Just a quick update on this story. It turns out that, as the article said, BT/Openreach cannot port the number from the FTTP FVA line to a MPF (Copper) line with another service provider, so they are in breach of OfCom “General Condition 18”. OfCom are now investigating to see what Openreach/ BT are going to do about it and when.